I am an Army wife and a mother of 7. I also grew up with 8 brothers and 4 sisters. There are few things in life that intimidate me. Cauliflower crust was one of them. 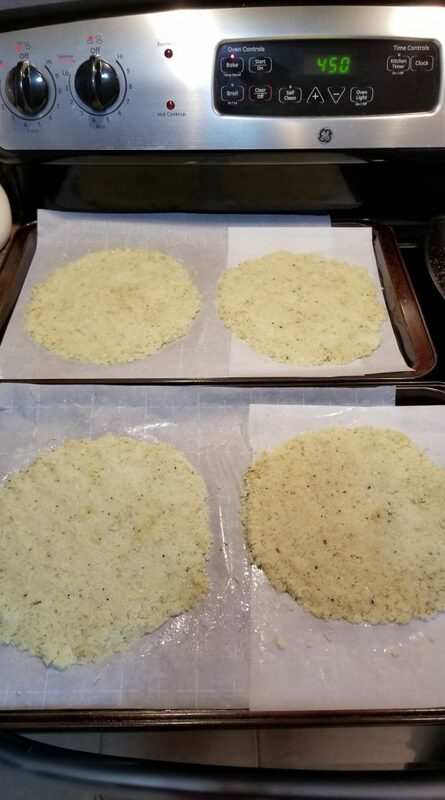 I have always envied my friends’ pictures of their cauliflower crusts knowing that it was probably something I could do, but I was always afraid to try for some reason. I’ve been cooking since I was 5 years old, so it’s not like I’m a novice in the kitchen. 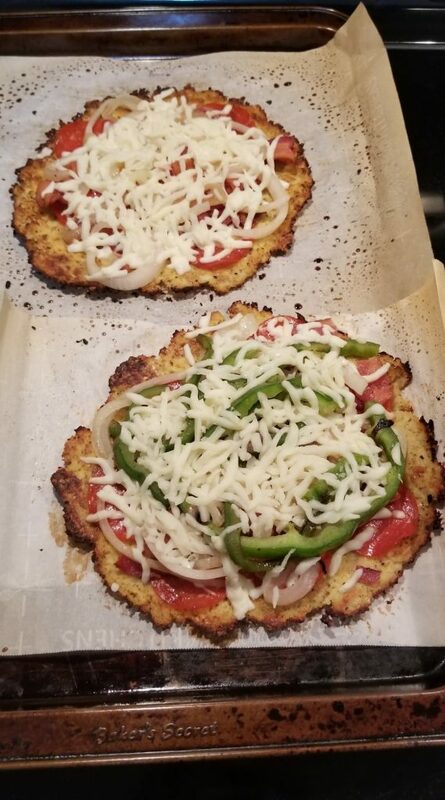 I have just always been intimidated by the thought of making my own cauliflower crust. 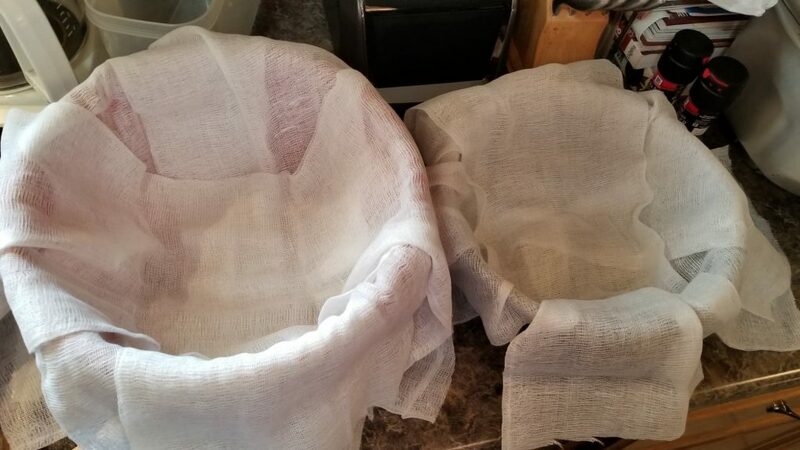 Once the cauliflower was done in the oven, I let it cool for about 5 minutes, then scooped it into the cheesecloth bowls and started to squeeze the heck out of it. 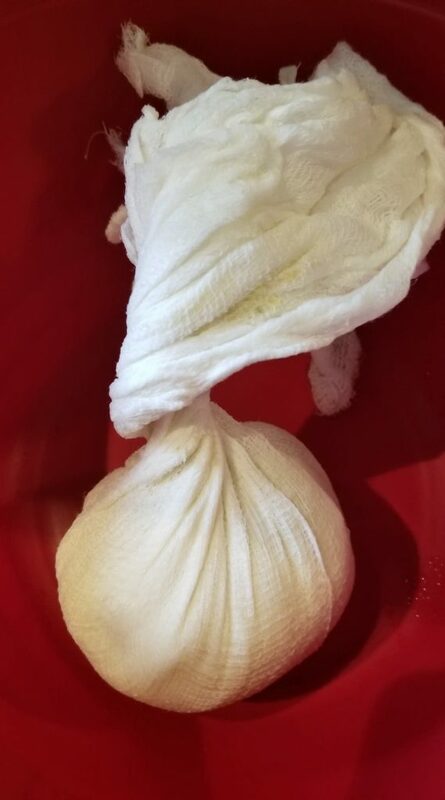 I found that if I twisted the cheesecloth that helped a lot with getting the excess liquid out. I also did various yoga moves combined with a little Circ du Soleil and some jazzercise just to get it all out but it was successful AND I got my workout in for the day. Bonus! 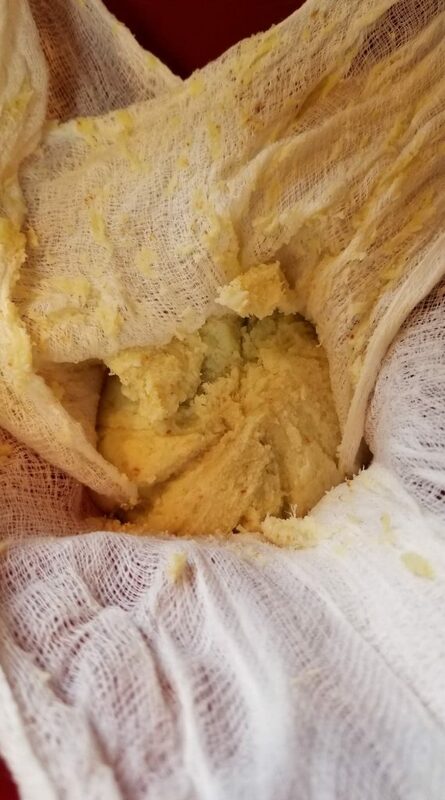 This was what the cauliflower looked like after all of my efforts in the squeeze department. If I ever doubted my ability to strangle someone, I am reassured I would be just fine after this experiment. That is a lot of work! And, just to give you a little backstory here, I had just mowed the entire lawn with a push mower before attempting this, so my hands were super sore! I do not recommend that…like ever! 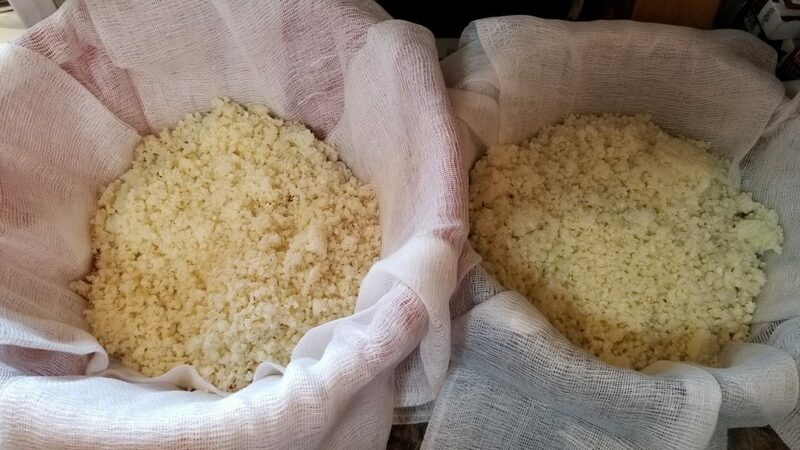 My friend told me that it should look grainy like Parmesan cheese if you got all of the liquid out. That was a really good tip! That was my goal here and it worked! 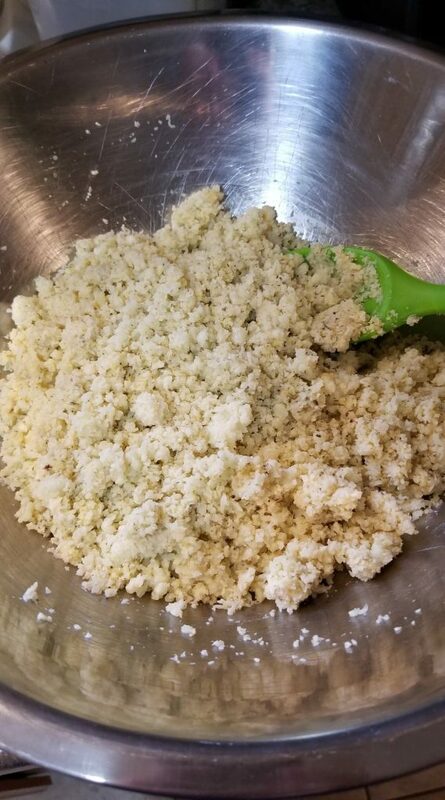 Next, I mixed the egg, Parmesan cheese, and herbs along with the salt and pepper in a stainless steel bowl…then I added the cauliflower and mixed it up well. 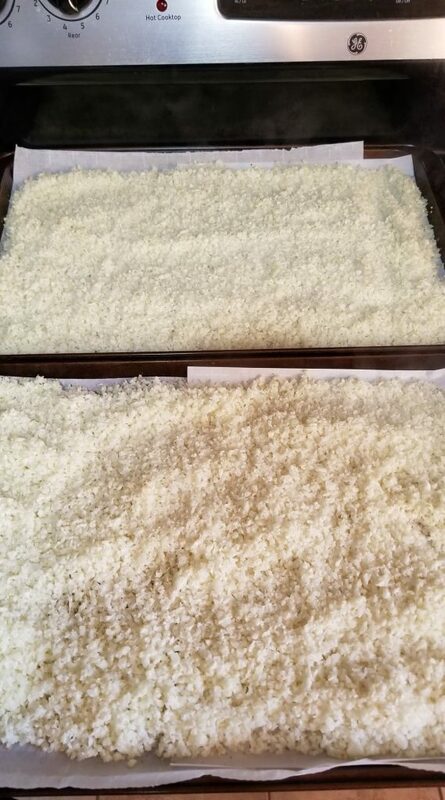 Next, I lined my baking sheets with clean parchment paper, sprayed them with cooking spray, and divided up my cauliflower mixture into 4 equal piles. I patted each pile out into a thin crust. It worked like a charm and all of the cauliflower held nicely together with the cheese and the egg. Perfecto! Oh, as you can tell in the picture, I also raised the temperature on the oven to 450 degrees! Almost forgot about that part…thanks, Mr. Picture! Now it came time to bake these bad boys for 20 minutes. I was so scared I would burn them, so I watched them like a hawk…totally unnecessary as they did not burn at all. Save yourself the trouble and just let them bake in peace. 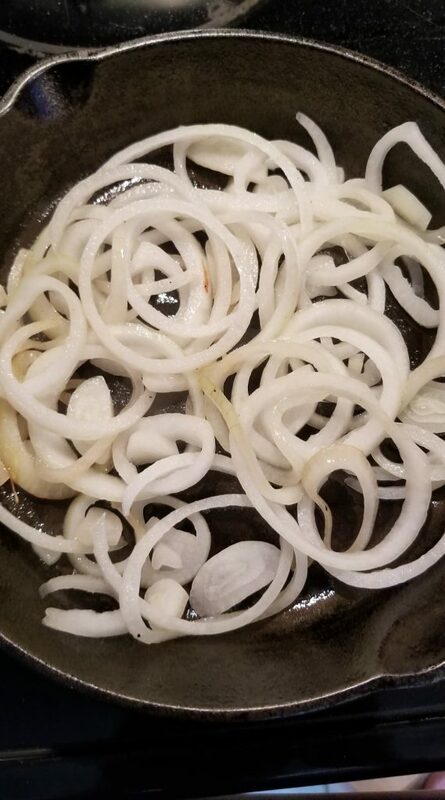 We wanted onions and peppers on ours but I knew they wouldn’t bake with the toppings on long enough to cook the veggies all the way through, so I pre-cooked the veggies. I also cooked bacon and crumbled it. These tasted so amazingly good…super cheesy and nutritious and I could eat guilt-free because I knew it was healthy. A few side notes: THIS WAS A LOT OF FREAKING WORK! Start to finish this entire process took me about 3 hours. I kid you not. I did dance around the kitchen a little (I was listening to The Greatest Showman soundtrack so…) and I checked Facebook a few times, but other than that I swear to you I was focused. That being said, I would definitely go through the process again but NEVER for my entire family! No way Jose! Not happening. There were only 3 of us home when I made this…I am NOT doing this for 9 people. If you have a smaller family or you’re having a stay at home date night and you and your spouse like to cook together, this would be perfect. All in all, I would say this was a success. Not only did we have a healthy, delicious dinner but I also conquered one of my fears in the process. I’d say it was a pretty successful day. Let me know what you think of this post. 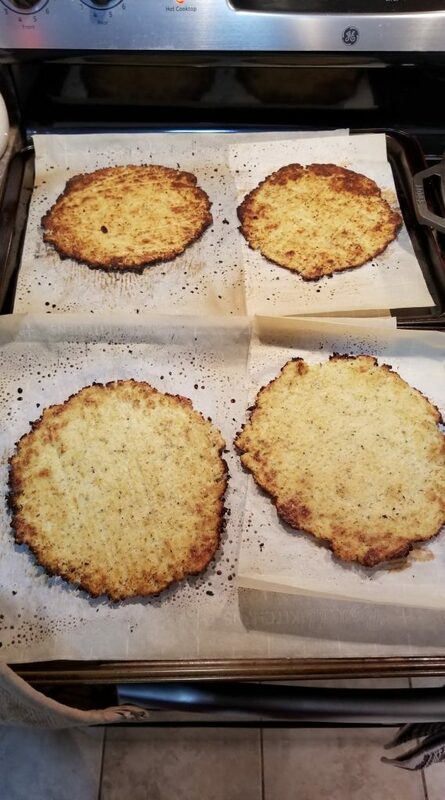 I’d really love it if you could share your cauliflower pizza crust tips in the comments so we can all learn together and make healthier meals for our families. This was so much fun! I hope you enjoyed my post. Until next time…happy eats! 1. Cauliflower crust is edible. 2. Don’t cut my grass. Bahaaa! Well, I’m glad to hear that my posts are both educational AND entertaining! Seriously, you need to try this crust! And you shouldn’t be cutting your grass anyway…that’s what AJ is for! Miss you bunches, sweet friend! Thanks for reading my posts!